All Nordic skis and bindings share the free-heel spirit but that is about all they have in common. Telemark skis resemble all-mountain alpine skis, with three pin or cable bindings that connect to hard plastic jointed boots. More so than alpine gear, telemark skis, boots and bindings work as a system. To choose the right system for you, you must first decide what type of telemarker you are. If you ski inbound, marathon style hitting the kickers and never missing a powder day, heavier skis, sturdy boots and New Nordic Norm cable bindings fit your needs. If you prefer gentle slopes and touring, you might like lighter skis and can then use lighter boots and New Nordic Norm Backcountry three-pin bindings. Two main styles of mutually incompatible bindings exist, the New Nordic Norm (NNN) and New Nordic Norm Backcountry (NNN-BC). NNN-BC bindings compliment lightweight touring emphasised telemark systems. Some skiers feel they are more comfortable because the fastening hardware is under the toe box rather than in front of the ski boot. NNN bindings best pair with stiffer plastic boots for decent emphasised systems. Whether you choose a cable or three-pin binding is a matter of preference. Three-pin bindings have three vertical pins at the base of the toe with a metal clamp to attach the boot. Touring skiers often prefer the three-pin style for the completely free heel and light weight. Difficulties arise with this style of binding if the pins are not inserted into the holes correctly, and over time cause damage to boots. However, they are less expensive than cable bindings. Cable bindings force the boot forward and into the binding and support the heel with the wrap round cable, creating resistance and control that steeps skiers like. Automatic step in bindings are new to the tele-world, and are gaining popularity with resort skiers. Some companies also make periphery devices that release the ski in a bad crash, though the nature of the free-heel naturally minimizes twisting knee injuries like blown ACL’s and MCL’s common to alpine skiing. Not all telemark boots fit in all telemark bindings. But, once you’ve narrowed down the binding, you can focus on boot comfort. Buying tele-boots is similar to choosing an alpine boot, as different companies make boots for different foot shapes. However, in the end it comes down to stiffness. Touring-specific boots are the lightest with only two buckles and a power strap. The lower cuff reduces skinning resistance and expended energy, and match well with lighter skis and bindings. The drawback is you sacrifice all-conditions control and power. The most popular style, all-mountain boots, are powerful enough to carve a groomed run, but light enough to skin in all day. The three-buckle design with a higher cuff transfers fine tuned movements to the skis and provides stability at higher speeds. Freeride boots support skiers in the aggressive speeds and terrain of resort skiing. The three or four buckles and stuffer plastic impart the most control of all the telemark boot styles. Just like alpine boots, professional boot fitting with foot beds, proper canting and shell stretching apply to telemark boots. 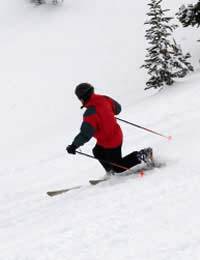 Choosing a tele ski follows alpine ski trends. In bounds and groomer skiers, may prefer skis with a narrower waist, providing faster transitions from edge to edge and less washing out. Wider, heavier skis provide stability, floatation and control through varying snow conditions and especially powder. Just as in alpine skiing, beginners generally choose shorter more flexible—therefore forgiving skis—while advanced skiers fine tune their choices based on snow conditions and terrain. As in alpine skis, the industry has realized the needs of women skiers are different from men and have responded with women specific telemark skis. The non-conformist nature of tele skiers means there are many individual ski designers. ScottyBob skis feature a half-tail that helps the skis maintain better edging throughout the turn. The company also hand makes custom skis out of Leadville, Colorado. Because most tele-skiers converted from years in unforgiving alpine boots, comfort is a major element to choosing a telemark system. Weight, binding style and boot fit combine for a perfect ski day of heel-freedom.